SPRO sales manager Syd Rives said the people he works with is the best thing about his job. When Syd Rives graduated from the University of Georgia in 2004 with a degree in consumer economics, he looked a couple of career-path options. "I wanted to be a sales rep (in the fishing industry) or something like that," he said. "Either that or real estate. "I think I made the right choice." The soon-to-be 38-year-old (his birthday is Sunday) native of Macon, Ga. has served as sales manager at SPRO since 2008. Prior to his promotion to that role, he spent a couple years as assistant sales manager, and before that he was a floor lead (supervisor) and salesman at the Bass Pro Shops in Lawrenceville. What does he like best about his current gig? "I think just the people I work with � that's the No. 1 thing. I also like to come out with new products that are really good and that I personally like to fish with. Yeah, I've got other (companies' products) on my boat, but if I'm going to crank, it'll almost always be with a Little John or a Fat Papa square-bill." He's responsible for a considerable amount of the company's marketing and social media presence, but he said his primary role is that of a problem-solver. "I'm there to support the sales guys out on the road. If they have a question about something, I'm here to answer it or resolve whatever problem they might have. "You have to be able to think on your feet and come up with a plan when something comes up. You need a thick skin because you're going to get yelled and get in some trouble from time to time. There's always something coming down the line, but in this business, that's just the way it is." 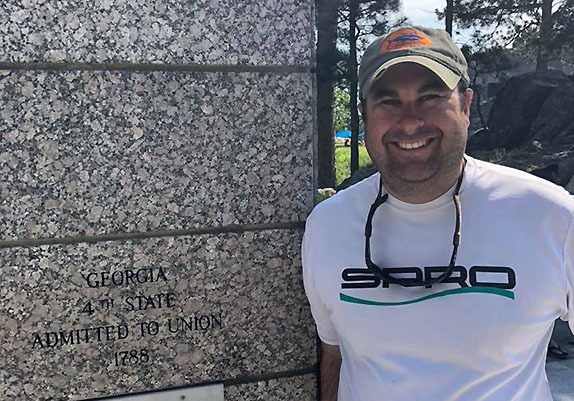 Rives' fishing roots trace to a farm in Sparta, Ga., where he often went as a child with his father and his dad's friends. He's a multi-species enthusiast, but was never bitten by the competitive bug. "I'm not a tournament angler � I just love to fish," he said. "I do everything from bluegill to saltwater for trout and redfish. "I get out 1 or 2 days a week; I make time for it on the weekends. I've got a little jet boat that I run on the rivers (the Chattahoochee and the Coosa)." He may not fish tournaments himself, but he works closely with several guys who do. One aspect of his job is managing SPRO's pro staff, which includes John Crews, Russ Lane, Dean Rojas, Mike McClelland, Shin Fukae and West Coast big-bass guru Bill Siemantel. He said he's in contact with each of them about once every other week. He's spent a lot of time recently conversing with McClelland, the designer of the hot-selling RkCrawler 55 crankbait, as a size 50 version of the bait is in the works and some new colors for the McStick jerkbait are forthcoming. He doesn't throw the RkCrawler a lot himself, as it's not perfectly suited the places he usually fishes, but he has some ideas as to why it's been popular among consumers. "It's got a larger profile and I think it dives deeper (than other baits of that size) and it really hunts when it kicks off a piece of cover. It allows for more variety � instead of running 8 to 9 feet, it'll get down to 13 or 14." Rives (pronounced Reeves) is a huge fan of the football team at his alma mater, but he won't get to watch the Bulldogs' always-heated matchup with Florida on Saturday. He'll be across the Alabama border at Lake Guntersville, helping to conduct his company's annual SPRO Frog Tournament. This year's field is monstrous � 309 boats! "It's going to be a madhouse," he said. "We've got people coming from Massachusetts, Ohio, Kentucky, Mississippi, Texas and even a couple from Arizona. We're giving away a ton of stuff � each boat gets two shirts, four or five frogs, two sun masks and a sticker packet. "Annamarie Genger, my assistant, has worked on this for 3 weeks straight and we've done our due diligence, like all the checks have already been printed. Little things like that make a big difference. This year the tournament director is Justin Locaitus, who runs our Havasu event. He doesn't have any alliances with anybody in the (Guntersville) area, so he can just do what he needs to do." > Rives and wife Jennifer have known each other since 2nd grade. They have a 6-year-old daughter named Riley. > He called Siemantel, designer of the company's BBZ line of big-bass offerings, "one of the best I've ever worked with when it comes to making a bait. He can go out to his workshop and make anything with a Dremel tool. He's one of the best fishermen I've ever been around and he's really in tune with figuring out things that are actually pretty complicated." > He's withholding opinion for the moment on the seismic shift in tour-level rosters brought about by the formation of the Bass Pro Tour. "I don't think it's necessarily good or bad or anything at this point, but maybe it was time for a change. Bass fishing's been pretty much the same since I've been alive. I get what they're doing � they're trying to make it more audience-friendly and bring new people into the sport and things like that. I know that more non-endemic sponsorship would mean more money coming into the sport, and that'd be good."